Just like the students Quill.org aims to help, the writing assistant’s algorithms get smarter the more they practice. 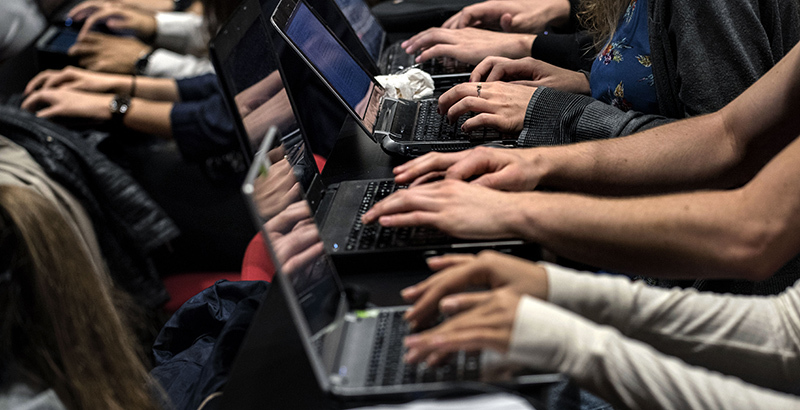 The nonprofit’s Quill Connect tool, designed to improve students’ writing skills through online exercises, uses machine learning to help them create better sentences. As Quill Connect gains more data, its algorithms morph and improve, says Peter Gault, Quill’s executive director — enabling it to address the big issues of sentence fragments and run-ons. But online tools weren’t always the best answer, since combining thoughts and sentences can yield thousands of correct results. So Quill built out a series of algorithms that can distinguish strong sentences from weak ones. That is where machine learning comes in. The algorithm looks at common patterns and criteria for strong and weak sentences, Gault says, and is now able to detect sentence fragments at 84 percent accuracy. 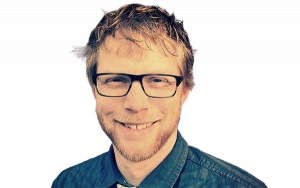 While not perfect, that mark is a vast improvement over the 30 percent accuracy of Microsoft Word and the 5 percent accuracy of Google Docs, he says. 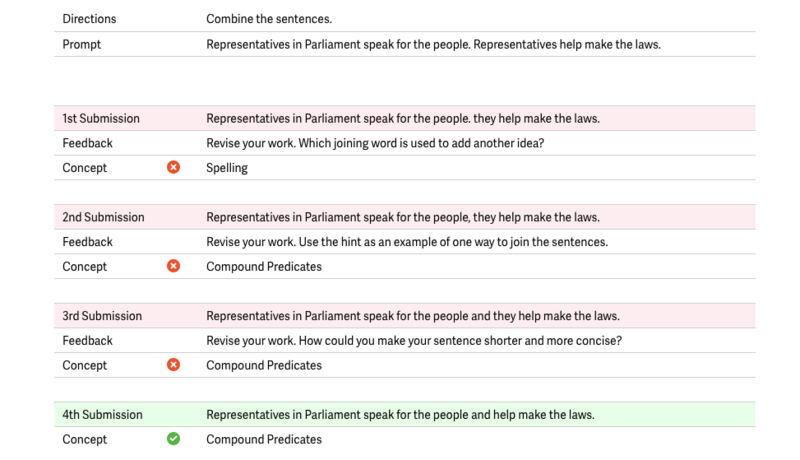 Quill Connect gives feedback on word and grammatical usage as it goes back and forth with students to guide them toward stronger sentences. In the example below, the student is tasked with bringing four ideas together to show how Patrick Henry inspired the colonists. In the first attempt, the student uses the word “and” to join the ideas together. Although “and” isn’t wrong, it isn’t the strongest way of joining the sentences. 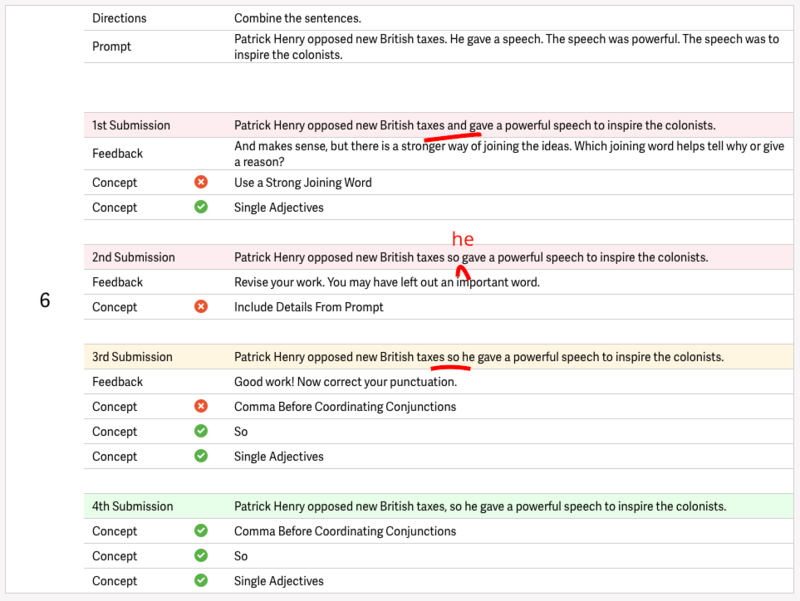 In the second attempt, the student has revised the sentence and has inserted the word “so” — but the sentence now also needs the word “he.” On the third revision, the student has added “he,” but there’s a comma missing, because when you join two complete sentences together, you need a comma to connect them. In this next example, the student’s goal is to join together two ideas to show that representatives both speak for the people and make the laws. In the first attempt, the student fails to use a conjunction to show the relationship between the ideas and instead writes two simple sentences. The feedback prompts the student to use a “joining word” to add another idea. In the second attempt, the student adds a comma to join the sentences but still struggles with the idea of using a conjunction to connect ideas together. Quill then displays a hint, and the student is then able to revise the sentence and add the word “and.” At this point, the sentence can be made more concise by removing the word “they,” and the student makes that edit to produce a strong sentence on the fourth try. “The algorithm gets smarter as we get more student answers,” Gault says. Since Quill’s launch in September 2014, more than 600,000 students have submitted some 60 million sentences, allowing for ever-increasing data to improve the machine-learning feedback. Quill Connect is used in more than 2,000 schools around the country, he says, with 60 percent of users in middle school. Free for students and teachers — districts pay for training and analytics, and philanthropists provide funding for low-income districts — Quill has tools for grammar, proofreading, and lesson planning, and this year introduced a collaborative feature that allows teachers to join the entire class in one lesson before sending each student into the program to work individually. There’s also a new diagnostic tool to help teachers assess students’ strengths and weaknesses. Originally incubated out of LearnLaunch in Boston, Quill is now based at New York’s Edwin Gould Foundation accelerator, which focuses on improving graduation rates for low-income, first-generation college students. The open-source nonprofit has partnered with researchers from the University of Hong Kong and Stanford University, as well as AT&T, and is exploring research-based strategies with the long-term goal of encouraging students, especially those who are economically disadvantaged, to pursue debate, journalism, and higher-order writing — work that fosters critical thinking at a deep level.